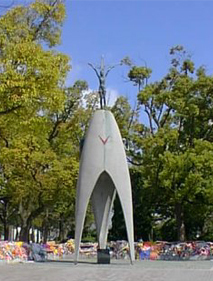 In Peace Memorial Park stands the statue of a girl, named Sadako, who died of leukemia because of the harmful effects of the A-bomb, which was dropped in Hiroshima August 6th, 1945. In the hospital she had folded paper cranes wishing for her recovery. Her story has moved countless people throughout the world and "one thousand cranes", believed to make one&apos;s wishes come true, have become a symbol of peace and hope. 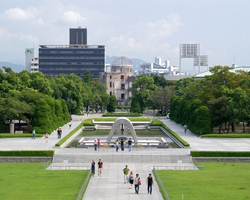 Many tons of paper cranes are received and displayed at various monuments, not only at Hiroshima Peace Park, but in Okinawa and numerous other places throughout Japan to honor and lament the innocent lives of people which were lost in the war. "Thousand Cranes" had been folded, one by one, with prayer and empathy for war victims in the past by people of all generations and nationalities as a symbol of hope for a peaceful future, and moreover as a solemn pledge to renounce war from the world now and into the future. 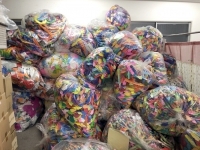 The Non Profit Organization, "Thousand Crane Project for a Hopeful Future", has been gathering these cranes and recycling them into paper which is provided to whomever wishes to utilize it keeping in mind the spirit of those who folded them. 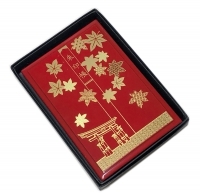 "The Thousand Crane Project for a Hopeful Future" also has made the recycled cranes into various products, such as notebooks, pens and bookmarks that can be shared with people throughout the world. Proportions of the proceeds go to the recycling costs, sending notebooks and pens to children in the countries involved in conflicts in the current world, and to sheltered workshops for the handicapped. These workshops make up an essential part of the "Thousand Crane Factory Project" by processing the cranes to prepare them to be made into paper and by putting products together. This factory project was developed to enable the shops to have increased working opportunities. The project also encourages volunteers, school children and others of all ages, to work together with the handicapped to promote mutual understanding, which we believe is the first step toward peace. Copyright © 千羽鶴未来プロジェクト All rights reserved.